Despite last week’s chill and blustery snow, we are in the throes of spring migration. Actually migration never stops. There is a bird somewhere on its way to somewhere else every month of the year. Purple martins have reached Florida by January. In June around the Cape May Migratory Bird Refuge you might find red knots headed north and least sandpipers headed south. Here in North America we generally think of migration in terms of spring and fall. If you ask birders when spring migration is, the most common answer is probably, from the beginning of April through May. That is because for most birders spring migration means returning Neotropical passerines (song birds) – those beautiful arboreal acrobats with the big voices. The woods and fields that have been quiet and cold all winter will awaken – color and music will return. But in truth, waterfowl and shorebirds – wind birds, given that name by Peter Matthiessen – “The restlessness of shorebirds, their kinship with the distance and swift seasons, the wistful signal of their voices down the long coastlines of the world make them, for me, the most affecting of wild creatures. I think of them as birds of wind, as ‘wind birds.’” – have been making their way northward for a month or so. Purple martins have been back in the states since January and some have already made it as far north as Iowa and Oregon. A couple of weeks ago I was at Lake Junaluska and there were red-breasted mergansers there in full breeding plumage and males were displaying, trying to impress the ladies. Today (3/30) at Lake J I saw a common loon in breeding plumage. There were also a number of northbound blue-winged teal, northern shovelers, buffleheads, redheads and lesser scaup. All the nesting swallows around the lake – barn, tree, northern rough-winged and purple martins are back as well. I saw a post on Carolina Birds FaceBook page from Dwayne Martin, ranger with Catawba County Parks, noting 50 or more common loons (most in breeding plumage) at Lake Hickory, plus a couple of dozen red-necked grebes. Today was also a day for a little serendipitous birding. We experienced a power outage a little after noon so my wife and I decided to go for a short walk. We were making our way along a dim trail that was grown over with smilax. We were going single file and I was looking back to see how Denise was navigating the briars, when she pointed ahead of us and asked, “What’s that little bird?” I turned to see a junco-sized bird flitting about in a rhododendron. I immediately assumed it was one of the ubiquitous dark-eyed juncos that spend the winter in the neighborhood, but when it moved out, into better lighting, I could see wing bars. 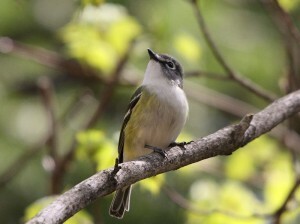 A little closer look revealed my FOY (first of the year) blue-headed vireo. I have also seen online posts from the Carolinas (many with photos) noting migrants like northern parula, black and white warbler, gray catbird and blue-gray gnatcatcher. Numbers are not big and there are no fallouts yet (except for waterfowl,) but it won’t be long. April is upon us and in a couple of weeks those numbers will start climbing and by the end of the month we’ll be up to our binoculars in migrants. And for something that will make you go hmmm, Martin has documented an ovenbird (seemingly healthy) that has spent the winter at Riverbend Park in Conover, Nc. He has photos of the little warbler under the birdfeeders in the snow, apparently eating seeds.